Older Apple displays can't pass the necessary signal through a Thunderbolt 2–to–Thunderbolt 3 adapter, but Mini DisplayPort adapters are on the way. Editor's note: If you are trying to connect an Apple LED Cinema Display to a USB-C MacBook or MacBook Pro, you should read this article. I have just taken delivery of an impressive shiny new MacBook Pro, but I don’t seem able to get my Apple Cinema Display (A1267) to work with it. I bought the Apple Thunderbolt 3 to Thunderbolt 2 adapter but that doesn’t work—I suspect because the monitor has a Mini DisplayPort plug not Thunderbolt 2? This is definitely prima facie confusing, and has perplexed tons of people who have considered buying a new MacBook Pro or purchased one and are trying to squash connectors together. Let me unpack the issue. DisplayPort is a display standard. There are dedicated connectors that only pass video using the DisplayPort standard. 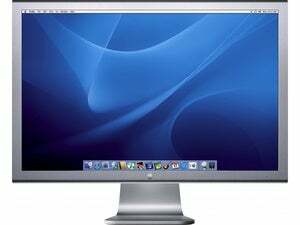 The 24-inch and 27-inch Apple Cinema Display LED models (including Roger’s) had a three-connector cable that included Mini DisplayPort, USB 2.0, and MagSafe power. Thunderbolt 2 rolled up a form of PCI Express data plus video using DisplayPort, and could support other kinds of data formats, like FireWire, through adapters or docks. The connector looks identical to Mini DisplayPort, but a Thunderbolt 2 controller and port could handle either a DisplayPort-only monitor or a Thunderbolt 2-supporting monitor, such as the Apple Thunderbolt Display, sold from 2011 to 2016. 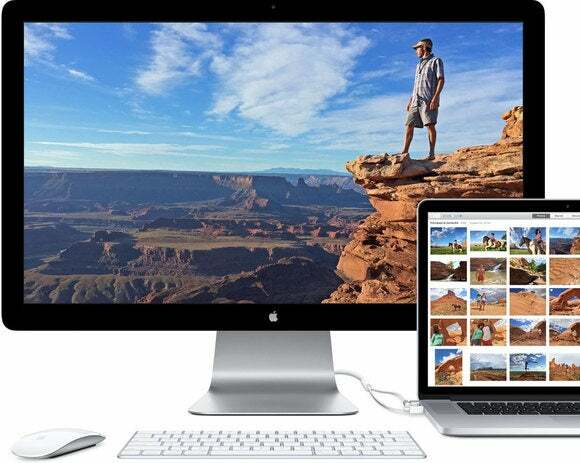 The Apple Thunderbolt Display used Thunderbolt 2 to connect to a Mac and deliver via the monitor FireWire 800, ethernet, USB, a camera, mic, and speakers. It also had a MagSafe power connector. Here’s where it gets tricky. The USB-C standard for connecting devices includes USB 2 and 3, but allows for a bunch of extras, including DisplayPort, which are called alternate modes. Which modes a computer or other device can use depends on the controller. Apple opted to include DisplayPort’s alternate mode with the 12-inch MacBook (2015 and 2016). The 13-inch and 15-inch MacBook Pros with Thunderbolt 3 support DisplayPort either over USB-C or as a mode within Thunderbolt 3! So a monitor that offers DisplayPort over USB-C (at up to 4K) can work with any Mac with USB-C, because all of those models support DisplayPort over USB-C. A monitor that offers DisplayPort via Thunderbolt 3 (at up to 5K) uses the same USB-C connector, but only works with Thunderbolt 3 Macs, as the DisplayPort data is encapsulated as part of Thunderbolt 3’s data stream. Thunderbolt 3 is backwards compatible with Thunderbolt 2. Apple’s Thunderbolt 2 to Thunderbolt 3 adapter can pass through any Thunderbolt 2 data and it works with the new MacBook Pros. That includes supporting the Apple Thunderbolt Display. The Cinema monitors with just DisplayPort support can’t work with the Thunderbolt 2 adapter, because they don’t wrap DisplayPort signals inside of the Thunderbolt 2 specification, so the data doesn’t pass over the adapter. However, it’s still just DisplayPort. If you could obtain a USB-C adapter with a Mini DisplayPort jack in it, you can use an Apple Cinema Display with DisplayPort on a MacBook Pro with USB-C. But there may still be a problem with 12-inch MacBooks. The folks at Nonda used Kickstarter to crowdfund the Hub+ back in 2015 to bring a full-featured dock that would have Mini DisplayPort for Apple Cinema Displays, passthrough power, and other features. Nonda canceled the project in October 2015, refunding all pledges. It said at the time it was unable to get an Apple Cinema Display to work reliably with the USB-C chipsets from major providers. Nonda later released the Hub+ mini (see our review) for just the 2015 MacBook with a reduced set of features, but still including a Mini DisplayPort jack. The firm reiterated to me a few months ago it hadn’t found chips that work with the 2016 model, which means the other solutions I note below may not work for either the 2015 or 2016 MacBooks. Adam Miller assembled a three-piece solution that works for him. One reader, Adam Miller, assembled a minor Frankenstein’s monster cable of a solution that he says works with his MacBook Pro! 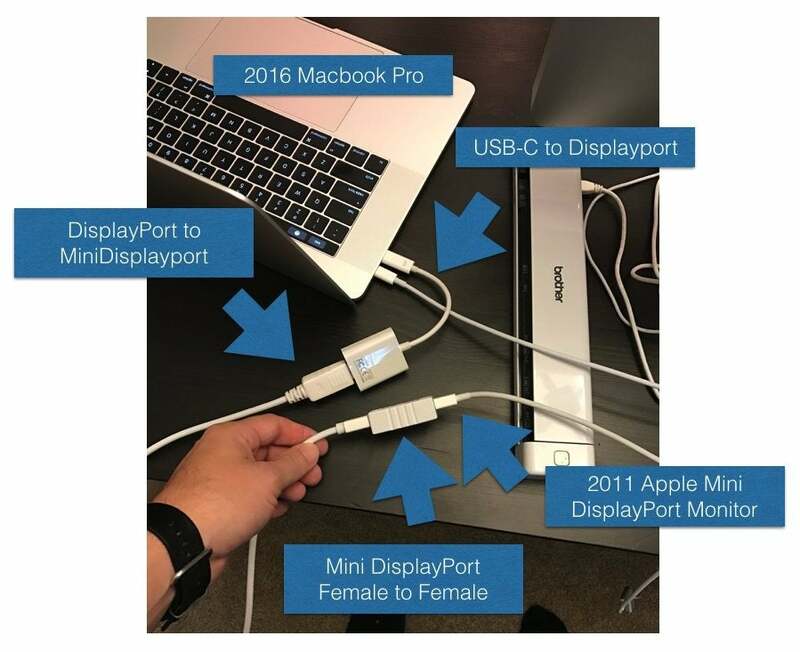 He used a USB-C to full-sized DisplayPort adapter, plugged in a standard DisplayPort to Mini DisplayPort Cable, plugged that into a Mini DisplayPort female-to-female adapter into which he connected the Cinema Display. It works! Several companies are also already making USB-C to Mini DisplayPort direct adapters that one reader reported to me worked great with his Cinema Display and a new MacBook Pro. These cost from $12 to $20. However, every version I can find ships directly from China via Amazon and other sites and the arrival date is late December to mid-January. Wait a couple of weeks for when pallets of these may have arrived at American distributors, making them immediately available.